I’ve been productive recently. Learned more of flickr, learned more of photoshop… and that was just some fun stuff. 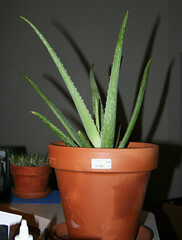 Mother of all aloe plants. (and now from wordpress) This seems to work well enough. Sadly… more proof (at least from Firefox) that there is something wrong with this theme. So I have switched back to the theme I had before the last one… I think this one will stay.